With traditional paper filing systems, it can take an average of 32 minutes to find one repair order document. 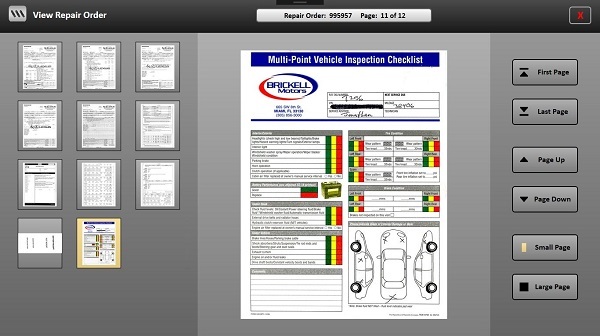 Document scanning makes it easier for your service department staff to work with repair order files. After scanning, ROs can be retrieved quickly and easily without having to call, email or leave your desk. With easy access to all your repair orders and other documents at the click of a button, you or your staff won’t have to waste time searching through boxes or file rooms in an attempt to locate the document you need. Your service advisors and staff can find documents in a couple of seconds. Instead of dedicating valuable office space towards records storage, you can reallocate it to a more profitable area for your service department. Allows service advisors and other employees to focus their time on business-at-hand, instead of endless document searches. Multiple colleagues can access the same document when required, reducing wasted time once again where paper files must be passed from one department to another. Your paper repair orders may be susceptible to deterioration or damage from unfavorable climate conditions or unexpected disasters. Service Scanning offers enhanced disaster recovery options to minimize impact. Digital ROs are securely backed-up to prevent your information from being permanently lost or accessed by an unauthorized third parties. Document scanning makes it easier for your company to fulfill its legal and regulatory obligations. Digital files can be organized, indexed and produced quickly to meet the demands of even the strictest auditor. How to Scan Repair Orders? 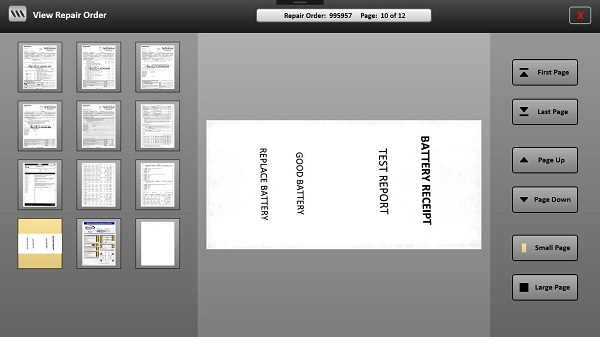 Place the repair order documents in the document scanner. Press the Scan button on the touch screen. The document pages will be scanned both front and back. RO number will automatically be retrieved using either Barcode or OCR (Optical Character Recognition). Document pages are then automatically stored as a PDF file which can be retrieved via our Service Scanning viewers. OCR and Barcode technology reads RO number from document and prompts user for verification. Allows scanning of small items like battery test receipts, coupons, alignment results, etc. Color scanning for Multi-Point Inspection sheets (MPI) and other items. Easy to use touch screen, one click to scan RO. 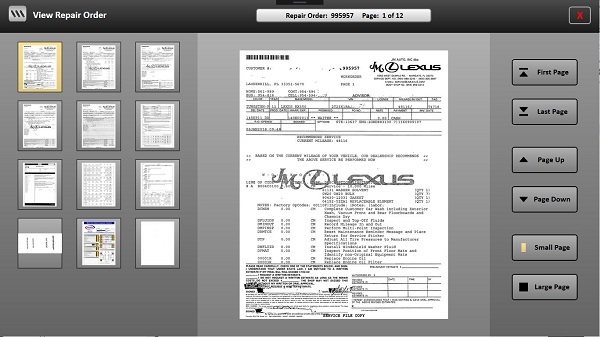 After scanning ROs can be easily verified via our document viewer. Scanned ROs can be can be viewed by service advisors, managers, auditors, warranty administrator, and accounting via our Service Scanning viewers. How to Scan Parts Invoices? 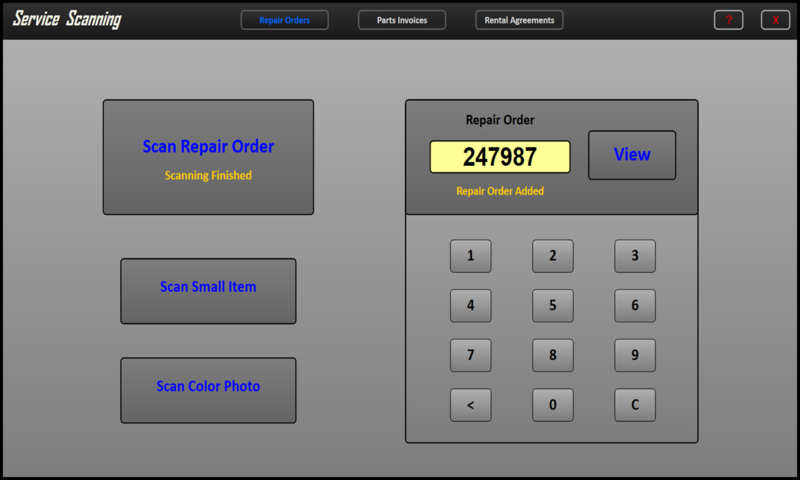 Place the parts invoice documents in the scanner. Parts invoice number will automatically be retrieved using OCR (Optical Character Recognition). OCR reads parts invoice number from document and prompts user for verification. 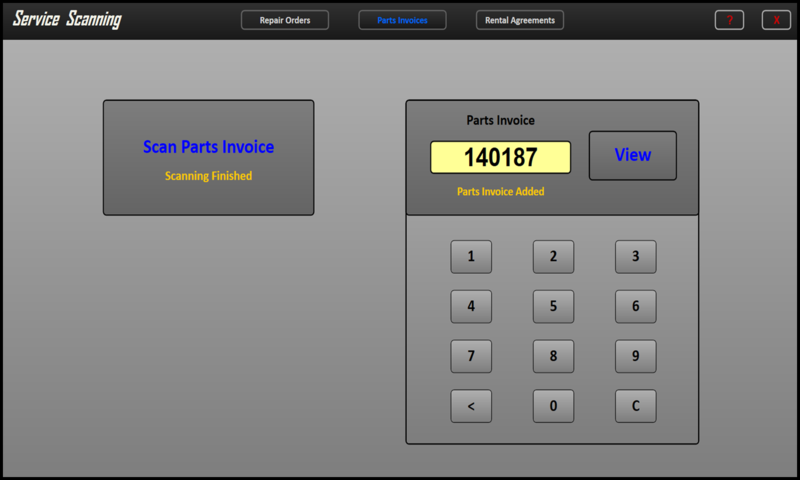 Scanned parts invoices can be verified via our document viewer. How to Scan Rental Agreements? Place the rental agreemnt documents in the scanner. Rental or loaner agreements can be scanned by RO number or other unique identifier. Intregation with TSD Loaner system for easy recall. Scanned rental agreements can be verified via our document viewer. Click View on main scanning screen. Quickly view and verify all scanned items. Easy and convenient document navigation.